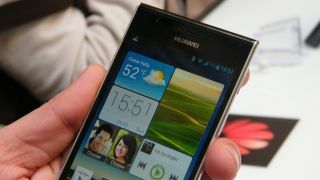 The Huawei Ascend P2 will be touching down in Blighty next month as the Chinese firm attempts to woo us with its most powerful smartphone to date. We attended the launch of the Ascend P2 at MWC 2013 in Barcelona where Huawei touted its new flagship handsets as "the world's fastest smartphone", although the more recently released Samsung Galaxy S4 may have something to say about that. What you get with the Huawei Ascend P2 is a 4.7-inch HD display, 1.5GHz quad-core processor, 1GB of RAM, 16GB of internal storage, 13MP rear camera, 1.3MP front camera and a 2420mAh battery - all squashed into a relatively slender 8.4mm chassis. Android 4.1 Jelly Bean is the operating system of choice for the Ascend P2, but Huawei has stuck its substantial Emotion UI over the top which controversially gets rid of the app draw all together. The Ascend P2 also brings with it 4G connectivity so we'd assume it will show up on EE as the network ranged its predecessor, the Ascend P1, but we're waiting for an official comment from the superfast carrier. One network has confirmed it will be offering the Huawei Ascend P2: Three, which will allow customers to hop onto its 4G network once it launches later this year at no additional cost. Pricing and availability will be announced in due course, but we'd expect the Ascend P2 to carry a rather attractive price tag to tempt people away from the expensive Galaxy S4, HTC One and iPhone 5 - potentially somewhere in the region of £350-£400.